The Spanish football team is completing the expansion of the “Benito Villamarin” stadium with the support of three Linden Comansa cranes model 21LC290 from rental company Eleva Grúas Torre. Real Betis Balompié, a football (soccer) club from the Spanish First Division (La Liga), is close to finishing the reconstruction works of its home ground, in the city of Seville. It is expected that the construction of the “Gol Sur” (South goal or South end), the last stands of the “Benito Villamarín” stadium, will end next June, right before the starting of the 2017-2018 season. The works, which started during the summer of 2016 with the demolition of the previous old stands, are being carried out through the football season without affecting the competitive calendar of Real Betis, who has played all home games at the “Benito Villamarín”. 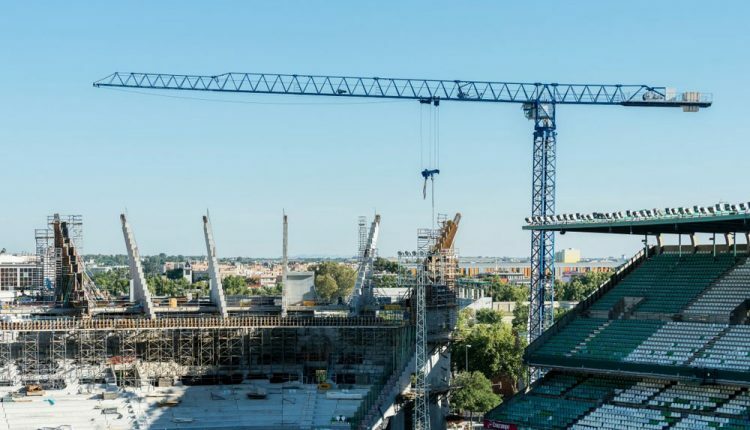 For the construction of the new structure, which will increase the stadium’s capacity in 8,000 seats, three 18-tonner Linden Comansa 21LC290 tower cranes were erected in October 2016, hired by general contractor Heliopol from rental company Eleva Grúas Torre. The stands under construction have a nearby street right behind them, which forced to close the traffic during two days and to speed up the assembly times. Furthermore, due to the reduced space between the new stands and the street, one of the cranes was erected on a 4.5-metres cross base instead of the 6-metre base, which is more common in this model. Since then, the three 21LC290 cranes work with a 54-metre-long radius, mainly lifting special formwork and precast concrete pieces of up to 7.000 kilos in weight. To avoid interferences between the cranes, the one located in between has a height under hook of 56.3 metres while the ones in the sides are working at a height of 42.6 metres. When the project ends, the new stands will have three heights or levels along with the rest of the venue and will not be independent anymore. Thus, the “Benito Villamarín” will give from the outside the impression of a compact stadium and will have capacity for 58,000 supporters of Real Betis. This is not the first time that Linden Comansa cranes are working at the green and white team’s coliseum, which opened in 1929. In the previous expansion of the stadium, carried out between 1998 and 2000, contractor Dragados installed three Linden Comansa tower cranes that helped to complete the “Fondo” stands, right in front of the Main stands, and the “Gol Norte” (North end), opposite to the ones that are about to be finished. Rental company Eleva Grúas Torre is a reference in Seville and the Andalusian region, and owns a fleet of more than 70 Linden Comansa tower cranes. Since starting operations almost 12 years ago, Eleva has participated in prestigious projects such the construction of the Melonares Dam and the Palmas Altas campus (headquarters of multi-national Abengoa) both in Seville, the Cadiz bay bridge or the refurbishing of the San Telmo palace, seat of the presidency of the Andalusian Autonomous Government.